50 Top Startups from 2010: Acquired, Pivoted or Still Going? This is one of the longest posts I've made - in length and duration. It's said that one year in the life of a startup is the equivalent of dog years when compared to more established companies. So looking back to a post I made just over four years ago is the equivalent of a generation of startups, and a quick glance at each shows what you'd expect from a generation of change - with some names graduating to the big time, others running in place, and yet a good chunk who've disappeared altogether. My goal with this June 2010 post was not to highlight the top private companies, as I withheld inclusion of many of the bigger companies, like Facebook and Twitter and Tesla. Instead, it was to show 50 I was following that had promise, leveraging a tool from Symbaloo. I highlighted 50 top startups on the Web. I was reminded of this effort when, at the conclusion of my kids' kindergarten year, many teachers featured computers with Symbaloo organizing their Web. So let's go back to the list of fifty, and see what's happened. How many are on the verge of hitting the big time, how many are out of business, and how many got acquired? At the time of the post, there was no buzzier company than Foursquare. It was the undisputed leader of the checkin. It beat back competition from Facebook Places, and its places database became the backend of even more third party apps. But its Swarm app has seemed to fall flat among users, and nobody's quite sure where the company's headed. At the time of my post, Spotify hadn't even made it to the US. Now it has 1,000+ employees and is the clear market leader in streaming music, with Apple's Beats and others chasing. The company is looking to finish the music business revolution started by Napster more than a decade ago, and remains one of my favorites. Automattic, the company behind WordPress, isn't going anywhere. They've got about 250 employees, and have been acquiring small services like Intense Debate, instead of getting gobbled themselves. They haven't had a big exit like Tumblr, or become a small part of a big company, like Blogger at Google, but they're a lead option for publishing, from blogs to full-featured sites. Posterous was acquired by Twitter in 2012, and while they initially promised their Spaces service for private blogging would remain live, it was quickly killed, becoming yet another acquihire. They'd raised $10 million overall. The Blippy I liked didn't turn out how I had hoped. Its initial privacy bump with credit cards being revealed online came at an inconvenient time, right as they raised funding and were poised to come out of the gate strong. That, combined, with an audience skeptical of their focus on oversharing, meant they had to do the dreaded pivot. Phil Kaplan, cofounder of Blippy, left with momentum flagging. Now they're an app for animated GIFs. In 2012, Slideshare was acquired by LinkedIn for a rumored $119 million. That'd probably be around $300 million in today's inflated market. #7: Tumblr Status: Acquired by Yahoo. Following incredible traffic growth, Tumblr became the biggest acquisition made by Yahoo CEO Marissa Meyer, who has a tough task to transform a Web pioneer. The $1.1 billion deal in May of 2013 was huge in many ways. #8 TweetDeck Status: Acquired by Twitter. The social networking client (which debuted here in 2008) was won by Twitter in a bid above $40 million, after a rumored buy from Ubermedia. TweetDeck founder Iain Dodsworth has since left Twitter, and is working in stealth on Gathers. The company, headed by Jack Dorsey, cofounder of Twitter, made a stake for itself in an incredibly challenging market, and you can see their payment readers in small businesses or cabs. You could argue they got too big too fast, or margins are tight, but they've neither crashed nor graduated since the first report. Quora is an odd duck. They were a Web darling at the end of 2010, founded by early Facebookers, and attracting engagement from a who's who of Silicon Valley. With one founder jetissoned, and the company now being a fifth wheel at Y Combinator, it's not sure whether they're the next Wikipedia or Yahoo! Answers. Nobody really questions the quality of the discussions, but everything else is questioned. The audio Web publishing service I really liked, and used regularly, is vaporized, as was my published content. The shadows of that plan show a site focused on cloud-based conference calls and Web seminars. Meh. If you don't remember the name Sports Blog Nation, I'll bet you've seen their content. This one time sports publishing empire expanded to what's now Vox Media, taking on smart writing for tech and much more. I've been lucky enough to see this happen in front of us over the last decade, and consider the founder of SB Nation, Tyler Bleszinski, a fellow A's fan, a good friend. If there are any questions about Vox Media, it's whether the content business can be valued in a world where it's so easy to make it for free. Once Twitter switched to its own t.co URL shortener, bit.ly's perceived value for short link and analytics dropped dramatically. The company refocused on performance tracking and engagement, and is still plugging away, even if you don't hear about them daily, as you used to. Months after my initial post, I expanded my time helping my6sense from consulting to something closer to full time as VP of Marketing. We launched a lot of cool tools, but there wasn't a big enough market (or funding) to make that dream a reality. So I left to Google, and the team refocused on mobile advertising. Founder Barak Hachamov is now working on Samba.me, a reactive video messaging play. #15: Thing Labs Status: Acquired by AOL. Thing Labs, and the Brizzly team, were acquired by AOL after getting an offer in July of 2010, which I had incorrectly hypothesized was from Foursquare. Soon after, Brizzly was shut down, and the team splintered inside of AOL, to take up roost at Avocado, Dropbox and other places. Plancast was given a funeral and the post-mortem was written in early 2012. The social events sharing company just didn't take off. The site still exists, focused on planning and event management. #17: Seesmic Status: Acquired by Hootsuite. After a bazillion pivots, and clear buddying up with Salesforce and Microsoft, the remnants of Seesmic were sold to Hootsuite in 2012. Founder Loic LeMeur seems to have retrenched into his annual conference, LeWeb. Lunch.com, a community around relevant news and opinion, has been very quiet - but seems to have its diehard users, as many of these sites get. I'd bet it doesn't cost much to run, so there's no urgency to shut it down, but it's hard to predict a rebound. #19: Gowalla Status: Acquired by Facebook. After years of chasing Foursquare's fumes, Gowalla's team waved the white flag, and was acquired by Facebook in December 2011. DropBox is a consumer cloud giant, and has managed a significant position, even when faced with industry competition from practically all the big names: Google, Microsoft, Apple, Salesforce to name a few. The world awaits what will happen once DropBox goes public. The lead developer made many intesting apps, including a Twitter and RSS mashup LazyScope, and Joint.im, but users haven't always followed. So Lazyfeed is gone. #22: Hunch Status: Acquired by eBay. The consumer-focused personalization company pivoted to providing services for businesses, and looks like a good fit for the online auction giant. Ecademy was acquired by Sunzu in July of 2012, and the open business networking community's content was later vaporized. Most the original Ecademy team is now working on social media tactics with Scredible. #24: Xobni Status: Acquired by Yahoo! Initially rumored to join Microsoft in 2008, the address book apps and plugins group was acquired by Yahoo! as part of Marissa Mayer's buying binge in the summer of 2013. Nik Halstead's smart consumer facing link site that pulled content from Twitter was sunset in 2012 in favor of analytics and more professional work, a move that made sense when Twitter reduced opportunities for consumer-facing developers. Even if Google Reader is dead (a moment of silence, please), RSS isn't. Feedly was among the most obvious to benefit from the feed reader giant's closure. Nobody really asks how Feedly makes money or what its future plans are… just that it keep working and doing well. It does. As they debuted here, I'm always happy to hear good news from team Feedly. I despise the idea of Klout. Independent arbiters giving you a score is distasteful. But that didn't stop the company from being famous (or infamous) and at least one other company deciding that their stockpile of data and faux reputation was worth paying for. So that happened. Congrats to the team. Justin.TV is still around, while most of the team(including Justin himself) now is working on Twitch.tv, a games streaming platform. Justin.TV recently told customers that videos will no longer be archived, since nobody was watching anyway. I have to assume most people at this point are watching YouTube. The Amplify we once knew, which encouraged you to build and share something between a tweet and a blog post, is gone - shutting down in February of 2012. Ironically, they pointed users to web clipping service Clipboard, which itself was shut down after being acquired by Salesforce.com a year or so later. After pivoting from the unfriendly world of real time search to the world of ad networks, OneRiot was picked up by the active, if not lofty, palace of Walmart Labs in September 2011. Lijit has had its share of bumps over the last four years. The company was picked up by Federated Media in October 2011, and in early 2014, spun out when Federated Media sold off its content business in the beginning of this year. Now, Lijit claims they're back, under a new name. Lost? Me too. Echo may first have been known as a comments competitor to Disqus and others, and was among the first to capture reactions from the real-time stream. They successfully moved to aid enterprise companies with adding social platforms and engagement with their platform. They're quietly executing - even if an endgame isn't obvious. MyLikes bills itself as the largest content and advertising platform in the world and has a top-notch board. The social advertising platform raised just under $6 million in 2010, and isn't noisy about trumpeting its success. Side note: Robert Scoble and I were introduced as advisors in early 2010 when they raised seed funding, but things are quiet on that front. Outbrain, like it or hate it, is most well know for its “more like this” or “you might also like this” type of content ads spread across the web. Their goal is more engagement on content, and they do a great job at it. They've raised nearly $100 million, with the last round being in 2013. In a “you didn't see that coming” deal, the photo sharing site team behind DailyBooth ended up as an acquihire for dodgy rental service AirBnB in the summer of 2012. Meanwhile, DailyBooth is dead. Gist, the one-time contacts manager, was acquired by Blackberry in early 2011. A little more than a year later, news came that Blackberry would shut down the original site. Oh well. The cloud service for remotely managing devices was acquired for more than $100 million by insurer Asurion in late 2013. Maybe not an exciting ending, but the checks still clear the bank - a good turn for $18 million funding by VCs. As with Gist, social calendaring app Tungle was acquired in early 2011 by Blackberry to improve their software suite. A fun idea for a quote repository and database, started by my good friend Drew Olanoff (and listing me as an advisor) didn't really get off the ground. Next time. Blog and content directory Regator is still tracking blog trends and aggregating news from the Web. But I haven't heard a word from them in some time, and they're not talking. Damon Cortesi's untitled startup ended up being Simply Measured. The social media analytics company now sports 159 employees and says it's used by more than ⅓ of the top 100 global brands. Hats off to you, Damon. I knew this was one to watch. Twitter's battles with developers over web clients and search made some promising ventures less so over time. Founder Cyril Moutran lists his time at Twazzup as ending in 2011 on his LinkedIn profile, spending more time on his role with Feedly. The Cadmus is no longer being maintained, but the team behind the Twitter analysis tool is working on a host of new products under the name Anomaly Innovations in San Francisco. The one time text and image-based pay per click advertising company, who once claimed hundreds of millions of ads on tens of thousands of sites, seemingly vaporized. Web site? Gone. Twitter account? Dead. Huh. Graphic.ly, the comic book enthusiasts platform, was integrated into Blurb earlier this year, having raised about $10 million in funding. BlockChalk, a Twitter-centric community bulletin board, renamed itself BlockBoard, and was later turned into an acquihire by Klout (see above) in February 2012. FitBit, in my view, lit the fire of the wearable gadget revolution. They're the default fitness tracker, competing with Nike, Jawbone and others, and I've been a devout user for the better part of two years - even if I wasn't at time of this post in 2010. So far, they've managed to keep independent. I'd see them being picked up by a big company before seeing them go public, but if they did, I'd invest. #48: RockMelt Status: Acquired by Yahoo! Yahoo acquired Rockmelt in 2013 and the products were shut down shortly afterward, despite rock star visibility at launch, and the support of Marc Andreesen. LiveIntent is focused on email advertising and engagement. They've been at it since 2009. And they're hiring. But if I had to do this list again, they're probably not top of mind. I loved Jason Goldberg's Socialmedian, and launched it here. Fabulis was his next attempt, a social network for gay men. I liked the idea, but wasn't the target market. When Fabulis pivoted into Fab.com, and had a meteoric rise for flash sales and other online commerce, I was again cheering on Jason from the sidelines, and root him on through the subsequent downturn. We'll see what happens with Fab, but Fabulis is most certainly dead. I never claimed I was ranking these fifty startups as the most likely to succeed, or ranking them in order, although it's easy to see the first ten named were stronger than the last ten in my list. But when the list was posted and people questioned the longevity of these companies, I knew it would take time to bear it out. With four-plus year hindsight, we have those results. Of the fifty companies named, 21 are independent, 19 were acquired, four pivoted, and six are dead. I expected more to be dead, outright, but it shows me many companies in search of an out found a willing corporate partner - be it another startup, or a large company, be it Blackberry, LinkedIn, Yahoo! or eBay. Tumblr sold for more than a billion, and Spotify is valued at much more. Others, no doubt, went for nothing except a handshake. Interestingly, none of these 50 were acquired by Google. If I were to do this again, with hindsight, there'd be less focus on Twitter tools, but in 2010, one thought Twitter's platform was not just an interesting testbed, but potentially a big business. And I didn't even mention Uber. 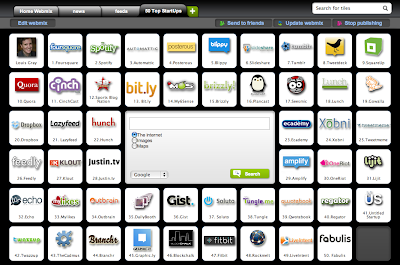 Meanwhile, Symbaloo, who hosted my original list of fifty… they're still around - and found a niche. 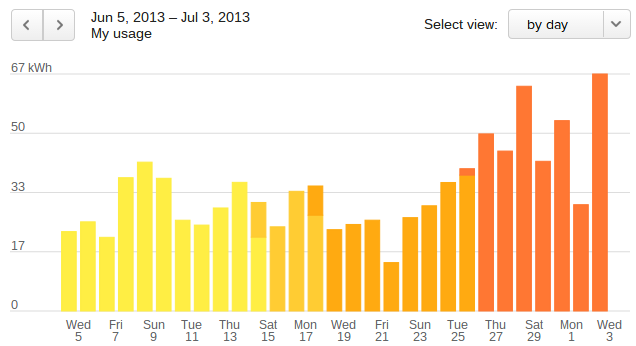 100 days ago, we fired up our solar panels from Sunrun, and started being an energy producer, instead of an energy hog. With a few bills under our belt, we’re saving as much money as we would have saved on gasoline had I bought two Toyota Priuses for our comings and goings. In the 99 days of records we have so far, PG&E tells us we produced more energy than we consumed in 82 of those days, and in the rare occasion where we’ve tapped the grid, it hasn’t been for much. Living in Silicon Valley, home ownership is already expensive enough without having to worry about whether my kids left the TV on or if my wife left the lights on when she left the room. With young kids, we do more than our fair share of laundry and dishwashing, and as a geek, I know our place is probably in the 1% in terms of plugged in devices and screens throughout the house. So our electricity bills have always been high - in the three digits every month. 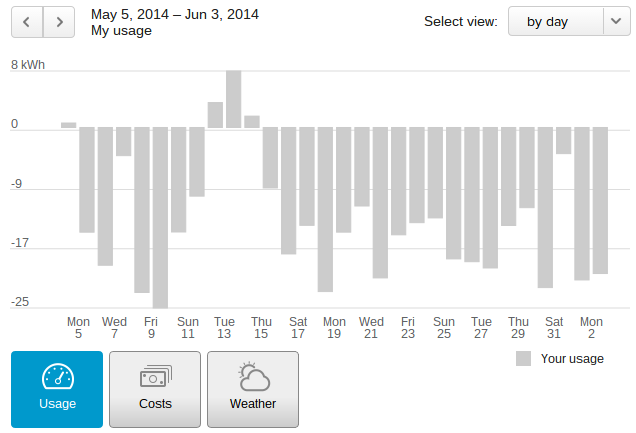 Last month, we poured about 500 Kilowatt hours into the grid. In talking with Sunrun, we were pretty sure we would be a good candidate for going solar, but I’ve never been more excited to take a look at our monthly, or even daily, statistics from a utility as we are now. Instead of paying more than $200 a month for electricity alone, well above the two tanks of gasoline I consume with commuting and bussing kids around each month, that bill has been taken down to Abraham Lincolns or Alexander Hamiltons instead of Benjamin Franklins. 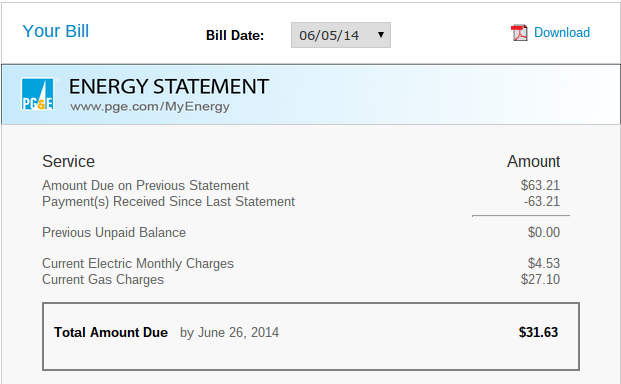 Our electricity charges last month? $4.53. 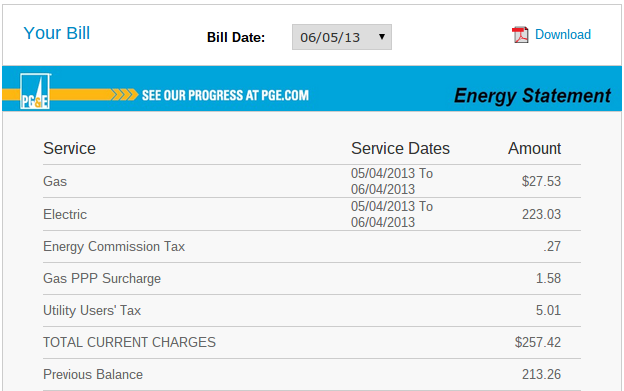 Our electricity charges last June? $223.03. As the season has warmed from spring to summer, and our air conditioning comes on earlier and stays on later, we’re no longer confronting the double to triple penalty rates we’d faced in years past. Last year, we’d be using between 25 and even 50 kilowatt hours of electricity per day. This year, we’re actually producing 20 kilowatt hours of power each day above what we’re using. Simply put, when the sun is out, I’m making money. Last year, running air conditioning burned us. This year it won't. In my first post in March after getting panels on our roof, I said it was “ like getting caps on your teeth to show a little bling to the neighbors.” And now my kids notice other homes around town that have gone solar, and call them out to me as we walk or drive by. It’s a pretty obvious statement. This Tesla is 4-5 times the cost of my going solar with SunRun. But I still want it. 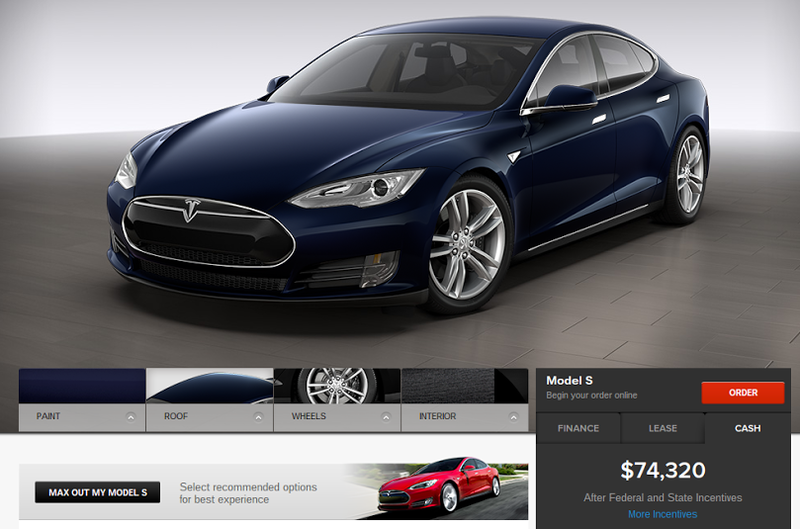 The next step, of course, is to consider ditching my gasoline-using car for a Tesla. I see them every day to and from work. I'd love to have one, and my kids already point out what they call “quiet cars”, like the Chevy Volt and Prius, and ask why we don’t have one yet. But they don’t realize the cost of a Tesla is five times what I paid Sunrun for 20 years of solar, with monetary benefits that trail solar. So until then, that part is a dream, but I’ve got two Teslas on my roof, and it’s a cool 70 degrees in the house. That will have to do. According to the Wall Street Journal, there are now as many as thirty companies who consider themselves startups valued at a billion dollars or more, based on how much money they’ve raised through private equity funding, and how much of the company they gave up to get that funding. But while the meme of “yet another billion dollar startup” is a fun one, the reality is that these are instead highly valued private companies who operate like public companies, and have the same kind of deep resources that most public companies have, but haven’t yet taken that leap to the retail trading markets - supported by changes in the venture funding process and new rules that make being a public company harder. Often, it’s too easy to label a private company as a “startup”, no matter the number of employees working there, no matter their revenue achieved, or how many years they’ve been in business or selling product. Uber, who has raised a reported $1.6 billion dollars, and sports an $18.2 billion valuation, is not a startup. Spotify, which has raised $521 million dollars, and is valued above $4 billion, is not a startup. The same holds true for Dropbox, Jawbone, Square, GoPro and other companies that have significant market traction and name recognition, but aren’t yet traded on the open markets. Using data we know, press reports show Uber with hundreds of millions in revenue (and a billion-plus in bookings) with plans to hire more than 1,000 people this year. Spotify is said to have more than 1,200 employees, tens of millions of users, and partnerships with every major label to have a practically unlimited supply of music. Dropbox reportedly is north of 500 employees, and 300 million users. So you can dismiss the concept of these companies being startups. A startup embodies an idea on the way to becoming a product on the path to becoming a successful company. Startups bring to mind working with single to double digit employees, making ends meet by taking risk, putting in crazy hours, and never really having quite enough resources to relax or reduce the pace of innovation. Startups are scrappy, not luxurious. What’s happened is that these companies have found ways to gain fast access to high amounts of capital, without needing to give up the majority of their company, and without needing to go public. And that’s largely due to two major developments that have changed the industry since I started working in Silicon Valley more than fifteen years ago. The first major development was the introduction of the Sarbanes-Oxley Act in 2002, which aims to protect retail investors through improved accounting and financial responsibility - setting high standards, requirements and auditing paths for public companies and those intending to soon become public. The act rose out of the companies built on vapor and lies, from Enron, Tyco, Worldcom and others, but while this was beneficial, it also added on additional headaches and costs to companies looking to graduate from private to public. Some, if they could, would prefer to stay private as long as possible, to avoid this scrutiny, as well as reporting to Wall Street every quarter, and being subject to their demands and whims. The second big development was the rise of markets where early startup employees could sell their options before the company even went public. While in the late 1990s and early 2000s, employees would have to see their company go public to get any money out of their options, and then be subject to subsequent lockup periods, you see people leaving companies like Twitter, Facebook, and others even before the IPO date, with millions of dollars in their pockets, through transactions on Second Market and the rise of funds like Lower Case Capital, who make those options real, by exchanging real money for options. The combination of those two elements reduces the demand from inside the company to go public - both from the restless employees and from the busy management. And you see the change in the way these companies now raise money. Instead of a small seed round, followed by an A round, companies raise millions in the seed round, and skip that step. Instead of a Mezzanine round followed by an IPO, companies will sometimes raise the hundreds of millions they would previously have gotten through IPO in a private round that extends their runway even further. You can see that with Sunrun raising $150 million in a single round, which included $100 million from an unnamed public investor, or Uber’s latest $1.2 billion round. If going public is a pain, and the benefits of going public aren’t there, then why go? So they don’t. Companies get funded and grow even larger, employees get rich and can cash out their shares, and when the company eventually does decide to file and place their shares on the NASDAQ or NYSE, instead of the big pop and sustained rise you used to see, retail investors find the big multiple increases have already taken place in the private markets, and the existing investors are the ones who get the lion’s share of the reward. Prior to joining Google, I spent 8 ½ years at the venture funded BlueArc, a network storage company which took in more than a quarter billion dollars in funding over its lifespan before being acquired by Hitachi Data Systems in 2011 (two years after I had left). When we raised $72 million in May of 2001, and were valued at more than $300 million, we hadn’t yet shipped a single unit for revenue. But you needed nearly $100 million to get off the ground in the hardware space - and that continues with companies like Pure Storage, who just raised $225 million at a 3 billion valuation in April. BlueArc may have been like a startup in 2001, but by 2004 and 2007 or so, when we were years into selling, had hundreds of customers and multiple product generations, we weren’t a startup. Just a private company that happened to be highly valued. So let’s recognize the world has changed a bit over the last two decades and call them for what they are. These aren’t startups - and most of the upside from investing in these companies comes before they even go public, not after the fact. The companies are disincentivized to be on the public market, and their employees, in many cases, are already getting the rewards that others of us could only dream of. We’ve got to come up with new terms and for emerging companies and tell them to check their startup credentials at the door. Disclosures: I used to work at BlueArc for 8 ½ years. I am a customer of SunRun and love their products. I work at Google, which you could assume competes with DropBox, Twitter and Facebook in some ways, and yes, some of my friends at Google Ventures are investors in Uber, but I have no bias in favor or against the company as a result.